Hoje comemorar-se-ia o aniversário da escritora britânica Virginia Woolf, autora conhecida por romances como 'Mrs. Dalloway', 'Orlando' ou 'Os Anos'. 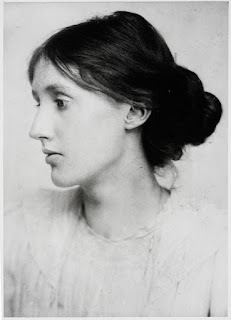 Ainda que tenha sido reconhecida essencialmente como romancista, a vários títulos revolucionária, Woolf foi também autora de vários contos, ensaios e reflexões. Um pouco para celebrar esta sua data, pensei em transcrever um texto do livro 'The Common Reader', escrito em 1930, quando precisamente se celebravam os 100 anos sobre o nascimento da minha poeta preferida, Christina Rossetti [1830-1896], sobre quem Virginia fala com uma actualidade impressionante para a época, e a quem se dirige directamente. 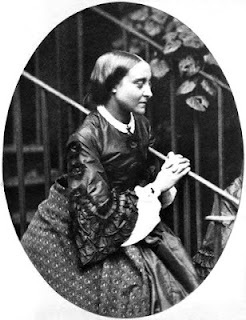 On the fifth of this December Christina Rossetti will celebrate her centenary, or, more properly speaking, we shall celebrate it for her, and perhaps not a little to her distress, for she was one of the shyest of women, and to be spoken of, as we shall certainly speak of her, would have caused her acute discomfort. Nevertheless, it is inevitable; centenaries are inexorable; talk of her we must. We shall read her life; we shall read her letters; we shall study her portraits, speculate about her diseases — of which she had a great variety; and rattle the drawers of her writing-table, which are for the most part empty. Let us begin with the biography — for what could be more amusing? As everybody knows, the fascination of reading biographies is irresistible. No sooner have we opened the pages of Miss Sandars’s careful and competent book (Life of Christina Rossetti, by Mary F. Sandars. (Hutchinson)) than the old illusion comes over us. Here is the past and all its inhabitants miraculously sealed as in a magic tank; all we have to do is to look and to listen and to listen and to look and soon the little figures — for they are rather under life size — will begin to move and to speak, and as they move we shall arrange them in all sorts of patterns of which they were ignorant, for they thought when they were alive that they could go where they liked; and as they speak we shall read into their sayings all kinds of meanings which never struck them, for they believed when they were alive that they said straight off whatever came into their heads. But once you are in a biography all is different. Here, then, is Hallam Street, Portland Place, about the year 1830; and here are the Rossettis, an Italian family consisting of father and mother and four small children. The street was unfashionable and the home rather poverty-stricken; but the poverty did not matter, for, being foreigners, the Rossettis did not care much about the customs and conventions of the usual middle-class British family. They kept themselves to themselves, dressed as they liked, entertained Italian exiles, among them organ-grinders and other distressed compatriots, and made ends meet by teaching and writing and other odd jobs. By degrees Christina detached herself from the family group. It is plain that she was a quiet and observant child, with her own way of life already fixed in her head — she was to write — but all the more did she admire the superior competence of her elders. Soon we begin to surround her with a few friends and to endow her with a few characteristics. She detested parties. She dressed anyhow. She liked her brother’s friends and little gatherings of young artists and poets who were to reform the world, rather to her amusement, for although so sedate, she was also whimsical and freakish, and liked making fun of people who took themselves with egotistic solemnity. And though she meant to be a poet she had very little of the vanity and stress of young poets; her verses seem to have formed themselves whole and entire in her head, and she did not worry very much what was said of them because in her own mind she knew that they were good. She had also immense powers of admiration — for her mother, for example, who was so quiet, and so sagacious, so simple and so sincere; and for her elder sister Maria, who had no taste for painting or for poetry, but was, for that very reason, perhaps more vigorous and effective in daily life. For example, Maria always refused to visit the Mummy Room at the British Museum because, she said, the Day of Resurrection might suddenly dawn and it would be very unseemly if the corpses had to put on immortality under the gaze of mere sight-seers — a reflection which had not struck Christina, but seemed to her admirable. Here, of course, we, who are outside the tank, enjoy a hearty laugh, but Christina, who is inside the tank and exposed to all its heats and currents, thought her sister’s conduct worthy of the highest respect. Indeed, if we look at her a little more closely we shall see that something dark and hard, like a kernel, had already formed in the centre of Christina Rossetti’s being. It was religion, of course. Even when she was quite a girl her lifelong absorption in the relation of the soul with God had taken possession of her. Her sixty-four years might seem outwardly spent in Hallam Street and Endsleigh Gardens and Torrington Square, but in reality she dwelt in some curious region where the spirit strives towards an unseen God — in her case, a dark God, a harsh God — a God who decreed that all the pleasures of the world were hateful to Him. The theatre was hateful, the opera was hateful, nakedness was hateful — when her friend Miss Thompson painted naked figures in her pictures she had to tell Christina that they were fairies, but Christina saw through the imposture — everything in Christina’s life radiated from that knot of agony and intensity in the centre. Her belief regulated her life in the smallest particulars. It taught her that chess was wrong, but that whist and cribbage did not matter. But also it interfered in the most tremendous questions of her heart. There was a young painter called James Collinson, and she loved James Collinson and he loved her, but he was a Roman Catholic and so she refused him. Obligingly he became a member of the Church of England, and she accepted him. Vacillating, however, for he was a slippery man, he wobbled back to Rome, and Christina, though it broke her heart and for ever shadowed her life, cancelled the engagement. Years afterwards another, and it seems better founded, prospect of happiness presented itself. Charles Cayley proposed to her. But alas, this abstract and erudite man who shuffled about the world in a state of absent-minded dishabille, and translated the gospel into Iroquois, and asked smart ladies at a party “whether they were interested in the Gulf Stream”, and for a present gave Christina a sea mouse preserved in spirits, was, not unnaturally, a free thinker. Him, too, Christina put from her. Though “no woman ever loved a man more deeply”, she would not be the wife of a sceptic. She who loved the “obtuse and furry”— the wombats, toads, and mice of the earth — and called Charles Cayley “my blindest buzzard, my special mole”, admitted no moles, wombats, buzzards, or Cayleys to her heaven. suddenly there uprose from a chair and paced forward into the centre of the room a little woman dressed in black, who announced solemnly, “I am Christina Rossetti!” and having so said, returned to her chair. With those words the glass is broken. Yes [she seems to say], I am a poet. You who pretend to honour my centenary are no better than the idle people at Mrs. Tebb’s tea-party. Here you are rambling among unimportant trifles, rattling my writing-table drawers, making fun of the Mummies and Maria and my love affairs when all I care for you to know is here. Behold this green volume. It is a copy of my collected works. It costs four shillings and sixpence. Read that. And so she returns to her chair. The metre of the principal poem [“Goblin Market”] may be best described as a dedoggerelised Skeltonic, with the gathered music of the various metrical progress since Spenser, utilised in the place of the wooden rattling of the followers of Chaucer. There may be discerned in it the same inclination towards line irregularity which has broken out, at different times, in the Pindaric of the late seventeenth and earlier eighteenth centuries, and in the rhymelessness of Sayers earlier and of Mr. Arnold later. I think she is the best poet alive. . . . The worst of it is you cannot lecture on really pure poetry any more than you can talk about the ingredients of pure water — it is adulterated, methylated, sanded poetry that makes the best lectures. The only thing that Christina makes me want to do, is cry, not lecture. And primroses that open to the moon. when Torrington Square is a reef of coral perhaps and the fishes shoot in and out where your bedroom window used to be; or perhaps the forest will have reclaimed those pavements and the wombat and the ratel will be shuffling on soft, uncertain feet among the green undergrowth that will then tangle the area railings. In view of all this, and to return to your biography, had I been present when Mrs. Virtue Tebbs gave her party, and had a short elderly woman in black risen to her feet and advanced to the middle of the room, I should certainly have committed some indiscretion — have broken a paper-knife or smashed a tea-cup in the awkward ardour of my admiration when she said, “I am Christina Rossetti”.